Just got back from Munakata Shrine. This year we moved to a small village in Chiba and Mizuka and I decided to go to the local shrine to pay our New Years respects. At Munakata Shrine, we met many of our neighbors, clensed ourselves and payed our respects. I've just uploaded some photos. Wow. Happy new year already where you live! May 2K4 bring you only the best. Akemashite Omeditou! Happy New Years! And a very wonderful year to you too, Joi! Happy New Year to you, Joichi! What are the names of the gods that are honored at the Munakata Shrine ? 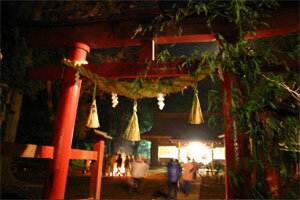 Listed below are links to blogs that reference this entry: Munakata Shrine. Joi Ito - "Munakata Shrine" by Joi Ito is licensed under a Creative Commons Attribution 4.0 International License.